It’s not too late to see some of my work, including large 24″x30″ prints, at Stanford University. They are now at the Center for Longevity and at CIS Allen, until mid-October. I’ve received nice feedback on my “Noctilucent” show at Stanford University, and now it has been extended through February 2015. So you still have time to see it and add your oohs and ahhs. UPDATE: This exhibition has been extended through February 2015, so go check it out. If you’ve been following my exhibitions over the last decade, you know that I’ve shown in San Francisco and the East Bay many times. Well, I’m branching out! 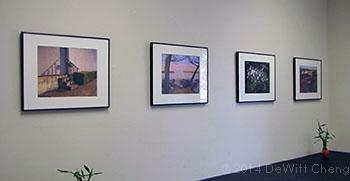 Peninsula residents now have an opportunity to see almost 20 of my prints at Stanford University. This show is curated by arts critic and writer DeWitt Cheng, who has written about visual art for many publications. Stanford Art Spaces is pleased to announce “Noctilucent,” an exhibition of Berkeley photographer John Vias’s elegant color images depicting silent, deserted East Bay locales at night. The show, at Stanford’s Institute for Research in the Social Sciences (IRiSS), 30 Alta Road, Stanford, continues until December 1, 2014. John Vias walks by night, literally, exploring his Ocean View neighborhood after dark with a digital SLR (in the past a medium-format film camera), a tripod, and no photographic lights. Paradoxically, these images shot in near-darkness often seem radiant—noctilucent (shining or luminous at night). Vias’s works reveal the mysterious beauty of buildings, park benches, piers, cranes, wires, streetlight poles, and greenery when the eye and brain of the photographer—and the viewer—have become receptive, slowed, if not stilled—and abstract qualities of shape, form and presence replace the functional, utilitarian ways we see (or don’t see, really) by day. Simple shapes predominate in these strongly abstract compositions, with occasional touches of humor. A book of Vias’s photos, Good Night, Ocean View, is available from the artist’s website, www.JohnVias.com, as are archival prints in several sizes. Stanford Art Spaces is an exhibition program serving the Paul G. Allen Building, housing the Center for Integrated Systems, the program’s longtime sponsor, and the David W. Packard Electrical Engineering Building, with smaller venues located throughout campus. IRiSS is located at 30 Alta Road, off Junipero Serra Boulevard, adjacent to Stanford Golf Course. All venues are open during normal weekday business hours. For further information, or to arrange a tour, please contact curator DeWitt Cheng at 650-725-3622 or dewittc [at] stanford.edu.